Make the heads flip whenever you costume up with this wonderful Cream color Cotton party wear kurti with Shantoon inner. The brilliant dress creates a dramatic canvas with superb print work. 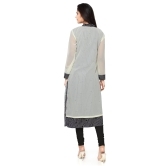 The length of Top is around 36 inches and is available in L, XL and XXL sizes.